Most building materials will always state that they should not be used in temperatures of 50C or less. It is not uncommon to see these temperatures during winter months in the UK and whilst we do advise that work should be carried out during the spring, summer and autumn, this is not always viable. The significant problem with using lime in lower temperatures is that of frost damage. As the temperature drops, the ability for a lime mortar to set decreases and if water is held within the mortar it will be more prone to freezing, which can lead to damage and failures. Whilst it is not the optimum time for working with lime, we have put together a list of tips that will hopefully help. Seriously its cold outside, don’t rock up in shorts and t-shirt, we already know how tough you are, frostbite and hypothermia doesn’t prove it any more or any less. A hot cup of tea is great, it helps keep the stereotypical image of a builder alive, although we were thinking more along the lines of a hip flask of whisky (or rum or whatever your poison, we aren’t the lime police)**. ** See our legal disclaimer below for this part. By using hessian as a sheeting material, it can act as an insulating barrier between the mortar and the external conditions. It can also be used as a screen to prevent water from coming into contact with mortar. However, the hessian cannot be allowed to get too wet, as this will counteract the insulating properties. A reasonable gap should be left between the mortar and the hessian, so it cannot damage the mortar in its early life. Read more about protecting and curing a lime mortar. 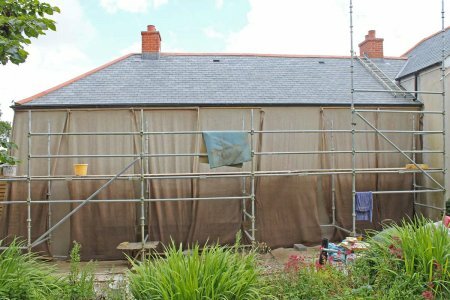 The use of sheeting, such as tarpaulin can create a rain screen, keeping water away from the mortar. When used in conjunction with hessian it can allow the hessian to act as an insulation barrier. Regularly monitor the forecasts and try to plan accordingly, although we appreciate forecasting can be hit and miss (looking at you Michael Fish). In particular avoid working where there is a high chance of frosts within a 2-week period. Whilst these are common for cement based mortars, they do not work the same with lime. The addition rates can be extremely difficult to measure on site and can result in reduced mortar performance or failure. Cornerstone WinterMix is a factory produced mortar, that contains carefully selected and precise additions that enable lime mortars to be used in lower temperatures. WinterMix is less susceptible to frost damage and easier to apply in the cold. We would still advise that protection from rain and frost is put in place. Alcohol should never be brought on site or consumed on site. You knew this already though, unless you’re drunk. If you do bring alcohol on to site, you will probably get sacked and we take no responsibility at all.